Head: Head short and broad with low set wide cheek bones, rounded muzzle and chin, forehead slightly curved, gently rounded contours and slightly curved profile. Nose of even width from bridge to nose leather. Eyes: Large, slightly oval shaped with rounded lower line, set slightly oblique and wide apart. Eye color to be uniform and harmonizing with coat color. Any shade from yellow/gold to green is accepted. In whites and vans the eye color may also be blue or odd-eyed. In pointed cats the eye color is blue on principle, the deeper the blue the better. Ears: Medium-large, wide at base with slightly rounded tips. Set wide apart and tilted slightly forward. Body: Medium sized to large cat, well-muscled and heavily built. Neck short and substantial, legs also muscular and of medium length; feet big, compact, round and well tufted. Tail as long as to reach the shoulder blade, slightly tapering, furnished bushy. Tail: medium length, thicker at the base, slightly tapering to the tip. Coat: medium long. Guard hairs are solid, glossy. On the flanks fur is softer, lightly-lying, very dense. Undercoat is double, but its grade of expressiveness depends on season. The decorative coat is long and dense around the back of the neck, a complete ruff and frill. Fluffy "britches" and the tail excellently trimmed with fur. Colors: The pointed variety is named Neva Masquerade. 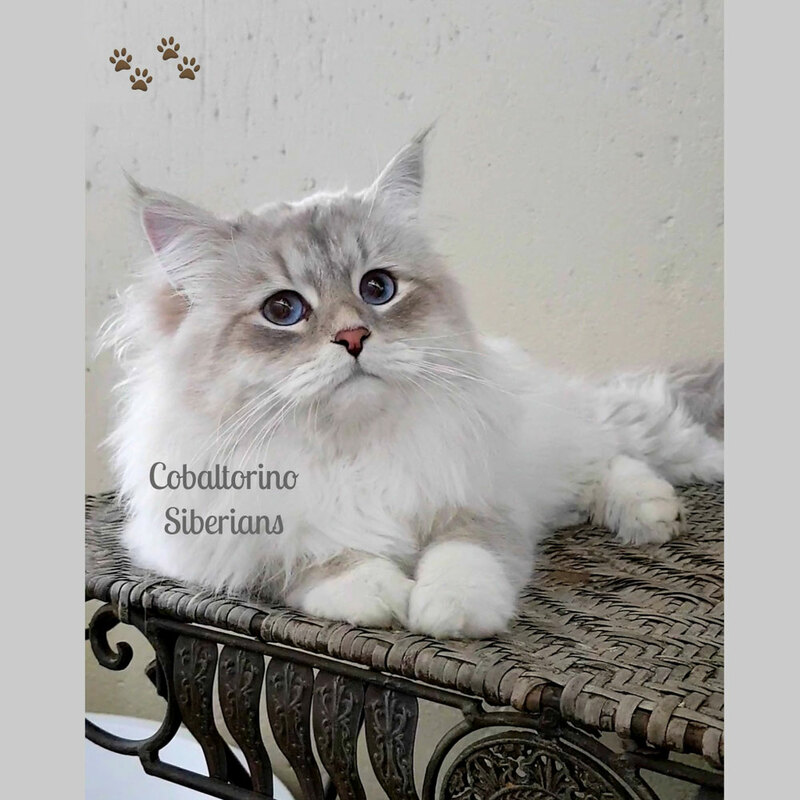 Chocolate and cinnamon and the according diluted colors (lilac and fawn) are not accepted in any pattern combinations (solid, bi-color, tri-color, tabby), either in the Neva Masquerade or in the Siberian. Burmese pattern is also not accepted.